Browse » Home » Blogging , John's Corner , Personal Commentary , Salutes » John's Corner: 2016 Theme? JOHN'S CORNER! This is the series where it is just me chatting with you straight up on things. I am someone who believes success in something like in any of my published content would not have garnered me any success had it not been for people who (at the least) given me a chance. I didn't buy success. I didn't nicely ask success to make me popular. But just the fact I got to encounter some amazing people is enough to make me feel thankful and proud. Even if people do not readily respect and honor me, I at least want to show I care about other people and entities. So what I want to do is offer some sort of support to show I care. In a continuing quest to try to boost positivity to a negative society, one of my latest moves is to try to offer some sort of tribute and salute to various people and entities. Making these tributes and offering thanks can range from offering encouraging thoughts to making all sorts of media material for fun. For example, I may make voxel artwork of certain people or maybe do a blog post on certain individuals. Some of these things I will have to be careful doing because I could make something that I find supportive but may offend someone. It's like when comedians roast or grill certain people- you may think it is funny, but someone may take it the wrong way and not get the joke or not like it. I am not a good joke teller, so don't worry about me here. As you can tell, I have no problem showcasing love and respect for an individual or set of individuals. Life is too short to be a hater. We all have to be thankful for many different individuals whom have helped us to be where we are today. Especially if you enjoy where you are today with help from others who helped you get there, you are certainly thankful. It is good to be thankful, but it is even better to express your thanks in your own unique and respectful ways. How I choose to help my cause and contribute to it depends. For now, I feel to offer my thanks to all whom have supported me and all whom I admire and respect any way I can. To all of my loyal readers and visitors, let's keep working together. 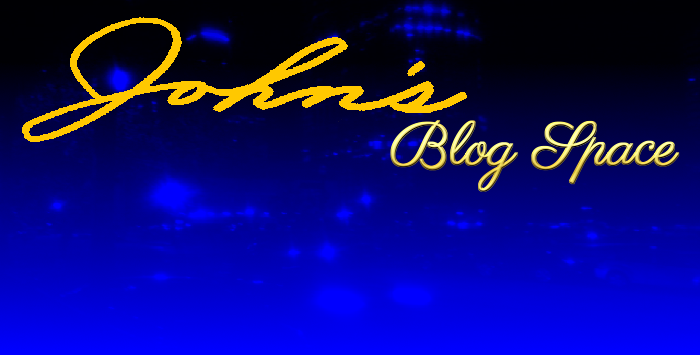 I would love to keep going on a great clip even as "John's Blog Space" nears another year of existence. Thank all of you for your support of all of my online work for as long as I've been publishing. I wish all of you be happy, safe, and blessed. Thank you for reading! Take care and be well.